I have this theory that certain months are defined by a color. January is white, February is red, and March, you likely already guessed…. is green. It’s the month of St. Patrick’s Day and also the month our thoughts turn to gardening. As we begin to approach the return of spring, it’s nice to welcome the season into your home by adding bits of this rejuvenating color. 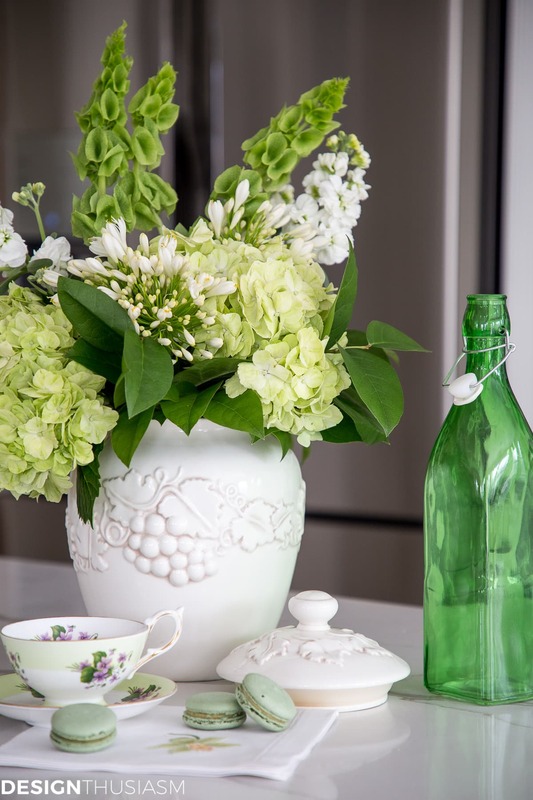 And what better way than with an arrangement of green flowers? Here are some tips on how I do it in my home. One of the things I most love about neutral decor is the opportunity to change the look of a room by adding various accent colors. 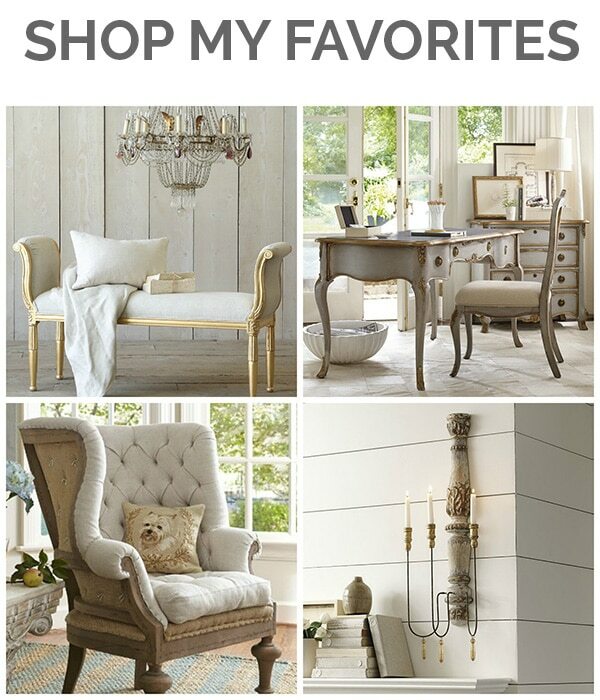 If you have at least one room in your home that’s neutral, this is a great place to start decorating seasonally. For me, my white kitchen lends itself perfectly to this concept. But green can be added quite successfully to rooms with color, as well. 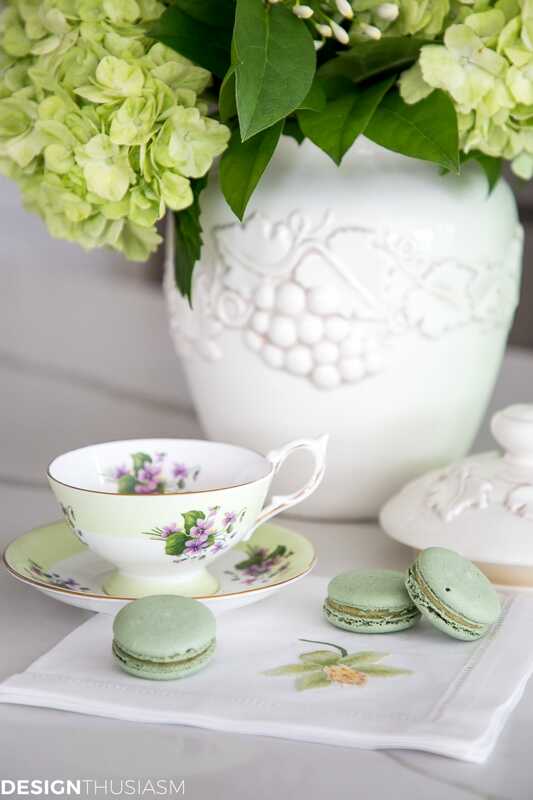 Before I start arranging the flowers, I often gather little edible treats that are coordinated with the palette to add to the vignette. In this case, my trip to the market for flowers also yielded a small bag of pistachio macarons. 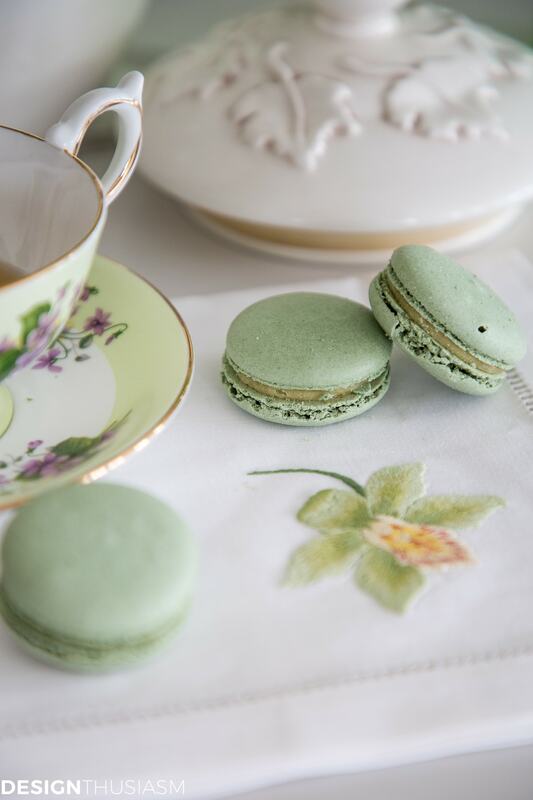 They’re delicious, charmingly French, and of course, green! But the star of this particular show is the floral arrangement itself. I wanted something that was especially appropriate for St. Patrick’s day, so the first thing I selected was Bells of Ireland. 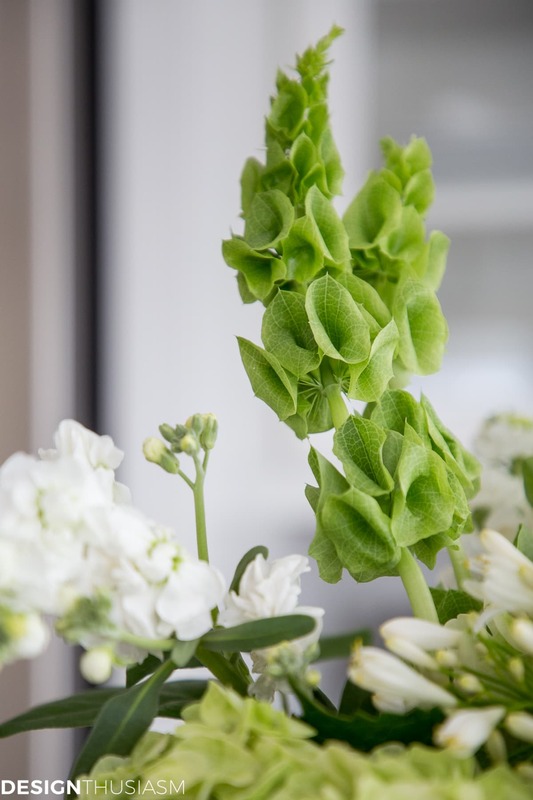 The fresh bright green color and long stems lend a unique look to the bouquet with height and movement. Next I opted for crisp white stock, a graceful feminine flower that I absolutely love. 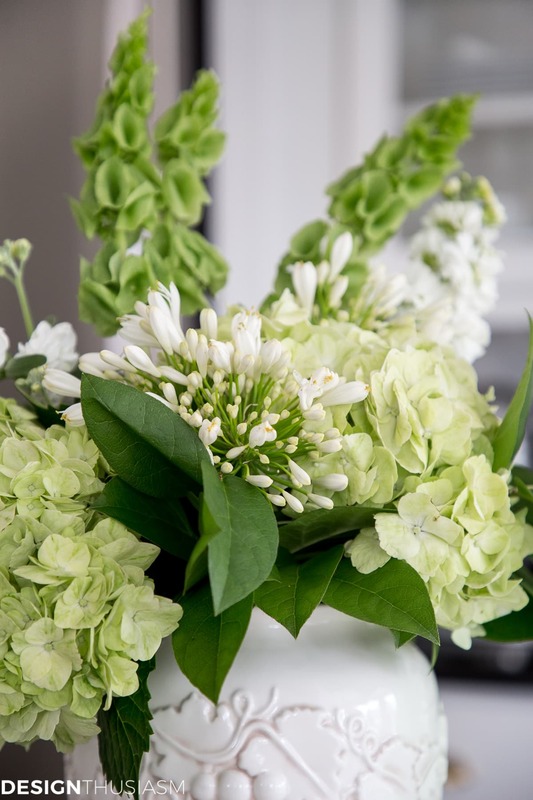 I wanted the arrangement to be strictly green and white and these ruffled blooms balance the green flowers perfectly. 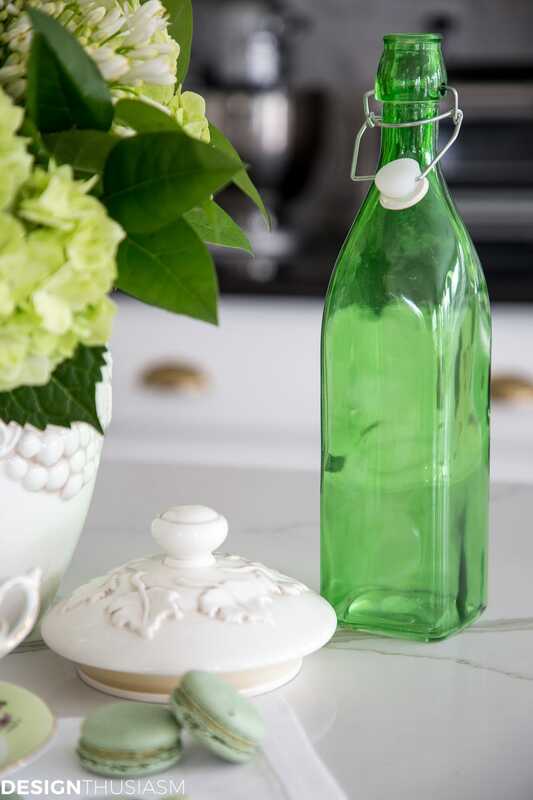 An emerald water bottle acts as a lovely complement, bringing out the darker leafy greens (these are lemon). 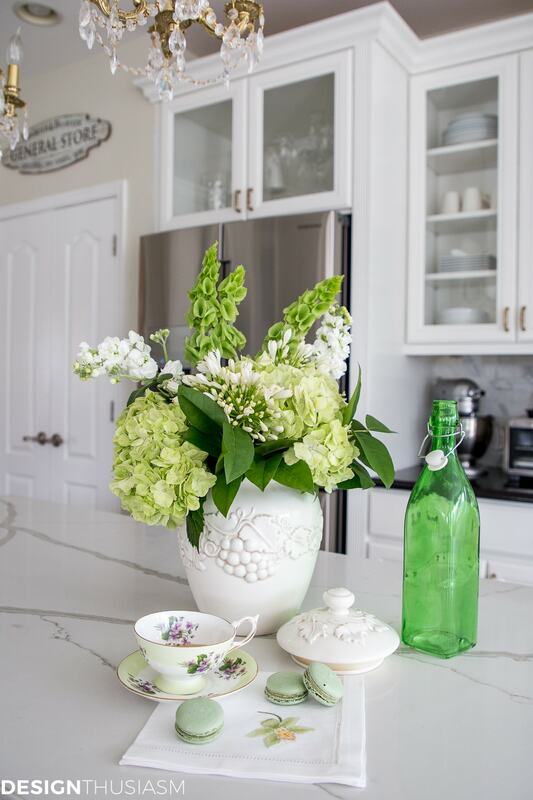 Pale green hydrangeas act as the base flower, lending volume and lushness along with their pretty spring green color. 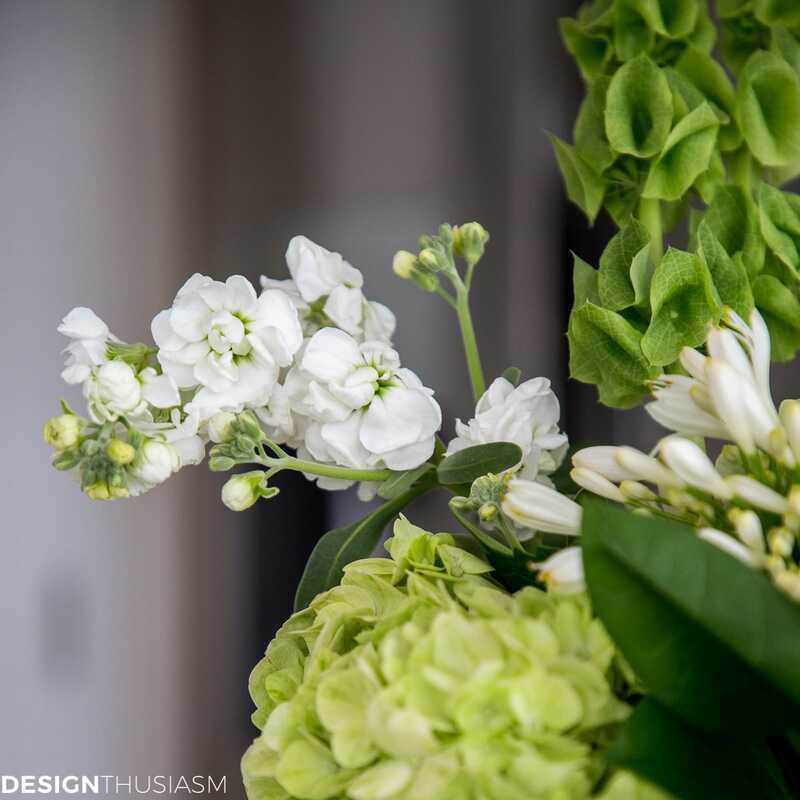 A few sprays of agapanthus add texture and interest and another pop of white to break up the greens. 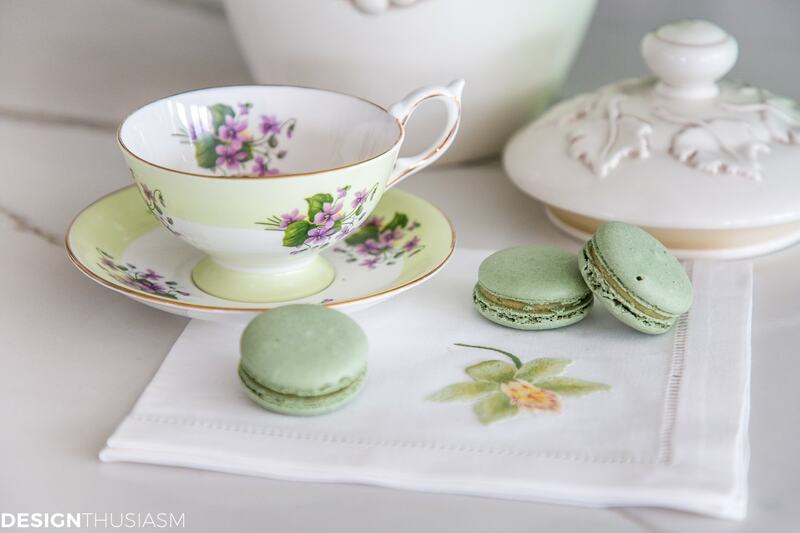 A sweet little teacup brings elegance to the scene, with pale green bands of color and a delicate floral, while a white hemstitch napkin with green embroidered flower rounds out this picture of living with grace. At first I was stumped as to what container to use, but a scan through my cabinets brought my eyes to this white cookie jar. It was exactly the kind of vessel I had in mind, but had completely forgotten about! I’m enjoying this early hint of spring sitting on my counter, and it’s expanded my yearning for the season exponentially. 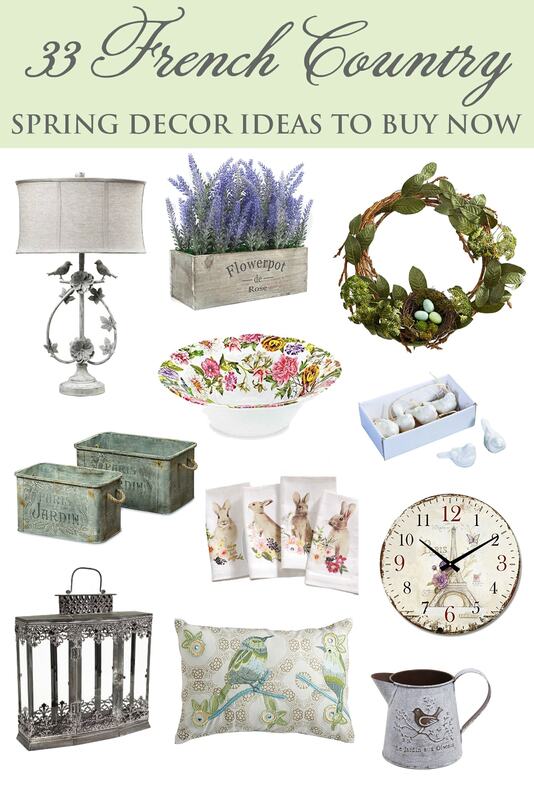 It seemed like a good time to update my shopping guide for ‘French Country Spring Decor Ideas’. You can find the updated guide right below, with corrected links and new items added. I so agree with your colors for each month. I was just sitting in my family room planning next months decor. 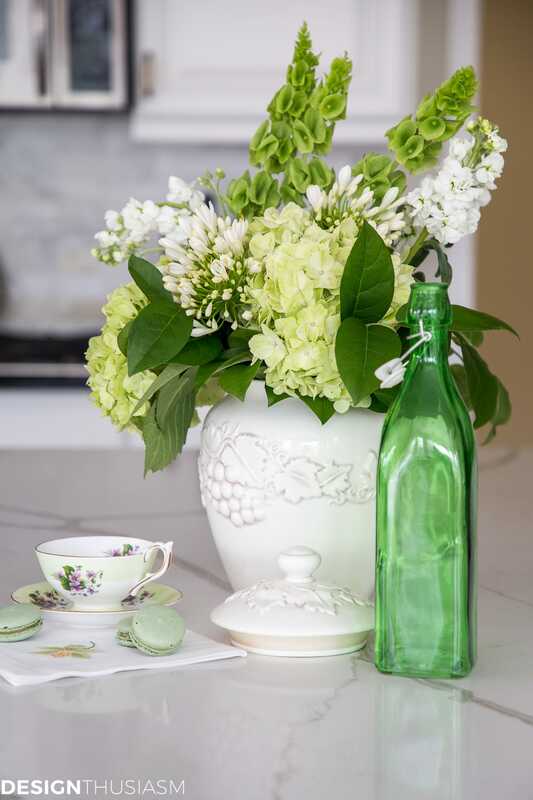 I love green and can’t wait to bring out some spring accents. My rooms are basically neutral so adding a color is relatively easy. My only problem is where to store the pieces I am changing up. Any ideas out there? Very pretty! Love the cookie jar, reminds me of vietre pottery which I purchased a lot of years ago, love the pretty rustic look of it with those lovely flowers. Beautiful floral arrangement! Love your monthly color theory! Gorgeous arrangement! I love bells of Ireland and am going to try and grow these in the old house garden this year for cut flowers. They look stunning with hydrangeas. Lovely. #popping over from #ttparty. I have followed you on Twitter as you have a lovely blog. Thank you so much, Sophie, and welcome!! Such an elegant vignette. Bells of Ireland are just gorgeous! This post will be Featured at the next Merry Monday party. Thanks for sharing. This floral arrangement is really beautiful. Soft greens that you only see in Spring with soft new leaves is my very favorite part of all the seasons. This arrangement captures that colour. I just love it.